Recordings for Thought Gang continued throughout 1992 and 1993, spontaneously happening during a run of sessions for an assortment of other projects. During a September 1992 recording date for Lynch’s HBO miniseries Hotel Room, ’Logic & Common Sense’ was recorded. “We would book a session for something, and then go off and do other things [toward the end],” Lynch recalls. “Once the players were in the room, we’d make hay while the sun shined.” Each player involved was a unique wealth of talent that enabled the improvisational approach to the recordings to flourish. Improvisation had always been an important tool in Lynch’s repertoire, and an early title for ‘Logic & Common Sense’ (originally entitled ’Headless Chicken’) reveals the original directive the musicians were given in order to elicit the performance. Bassist Reggie Hamilton remembers distinctly how Lynch set the tone of the improvisation, recalling thebrief but descriptive sentence: “Imagine you’re a chicken with your head cut off running around with a thousand bennies shoved down your throat!” What followed was a frenetic, amphetamine-­esque musical conversation between seasoned players for exactly 3 minutes 32 seconds before the end of the 2” tape whipped across the Studer’s play head, flopping against the take­-up reel and cutting the recording short. Every inch captured from that performance can be heard on the final record, down to the roll out. Both ‘Frank 2000,’ ‘Summer Night Noise’ as well as an alternate instrumental mix of ‘Logic and Common Sense’ would score scenes from season three and aid in defining the show’s distinctly experimental, noise­tilted soundtrack. 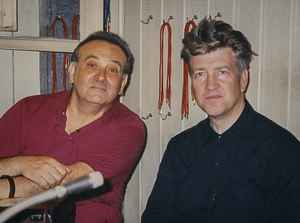 “It’s sort of like jet-­fueled jazz in a weird way...but it’s all based on stories,” says Lynch. “It’s Modern Music.” Those two words seem to efficiently capture both Thought Gang’s essence and distinctively genre­less genre. Quite often music that finds release beyond its decade of creation experiences a bit of an aural patina resulting from the process of marinating in the ether of time. Perplexingly, Thought Gang retains a contemporary quality difficult to quantify. 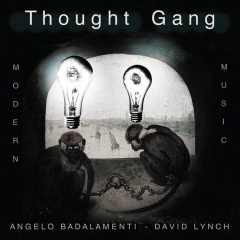 “I actually had the name Thought Gang along time before we even recorded anything for it” Lynch casually remarks...and, fittingly, the resulting album somehow still sounds ‘modern’ and will continue to remain ‘modern,’ decades upon decades after is creation.